Mason County´s Lake Nahwatzel covers 269 surface acres and reaches depths of about 25 feet. It is located at 440 feet of elevation about 12 miles west of Shelton. The water is clear, spring fed and is one of the cleanest lowland lakes in the state. It is so clean that it is actually used for drinking water by some of the local residents. 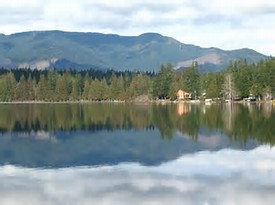 To get there from Olympia, travel north on Highway 101 to the Shelton-Matlock exit and travel west for about 10 miles. From Bremerton, travel south on Highway #3 to Shelton and turn right on Railroad Ave. and travel west for about 12 miles.